The resort of Playa Paraiso is a great spot to enjoy a relaxing break between the southern resorts of Playa de las Americas and Callao Salvaje. This resort has developed slowly over the past twenty years or so and is home to many self catering apartments and villas with a small selection of hotels too. It is now on the international music map with the recent opening of the stylish Hard Rock Tenerife Hotel, a first class hotel with a trendy pool scene and a selection of ala carte restaurants. The beach is small and compact but is often quiet, it has stunning views out over the Atlantic Ocean and is a great place to soak up the year round sunshine. The saltwater Lido is a good alternative to the beach with its tropical feel and the gentle trickle of the waterfall making for a relaxing atmosphere. There are a small number of bars and restaurants and a low key nightlife, with entertainment usually centred in and around the hotels, the resort is perfect for families and couples wanting to escape the hustle and bustle back home. For a far more choice of bars, discos, clubs and places to eat, Playa de las Americas is only down the road and reached by bus or taxi. Holidays to Playa Paraiso are a perfect for relaxing but also for having a great base for exploring this beautiful island. 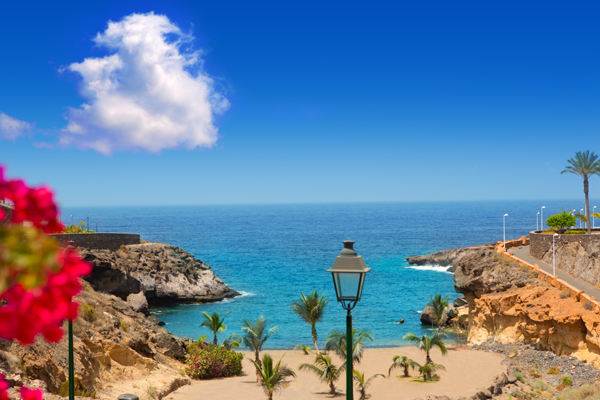 Take a boat trip to search for the whales and dolphins that live offshore or head to one of the water parks or go-karting tracks in Playa de las Americas for a fun day out. Have a browse around our site or call one of the friendly team here at JLM Travel and we will find you the best deal around!